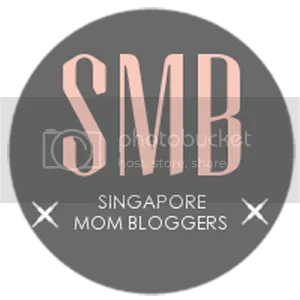 In this post, we have included relevant blogs from both international and local examples to inspire and motivate you! First, Let me introduce our Gift Sets to you. 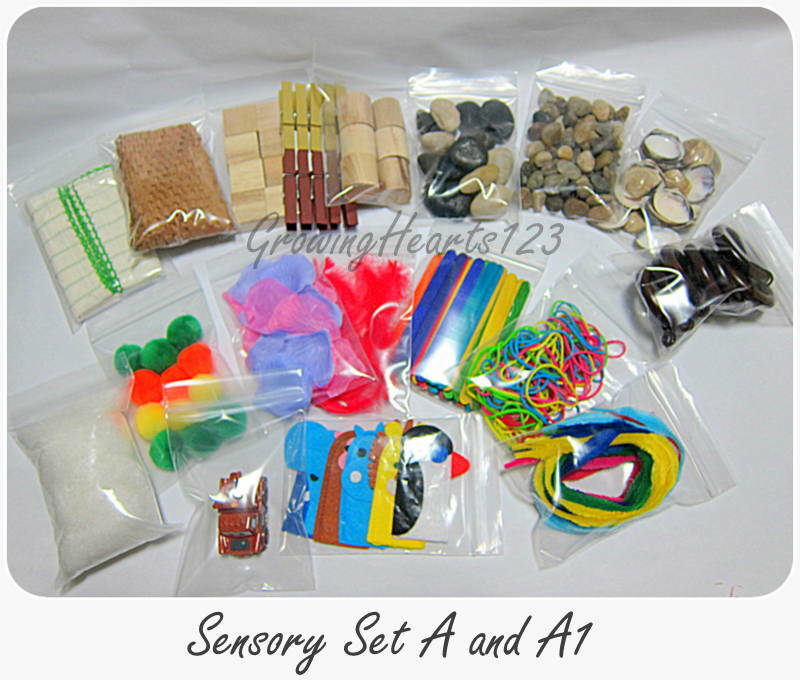 The photo is an example of how you can set up your sensory play. You need not include all materials at one go. This basket is my ‘hard’ texture Play Set. You can teach aplenty over here. For instance, you can categorise under natural materials (Seashells, stones, items of wood) and bring their attention to the difference between the colours of nature vs colours of the felt cloth, plastic tong and plastic toy vehicle. You can also use the shells and stones to teach numbers by writing on them or pasting stickers on them. 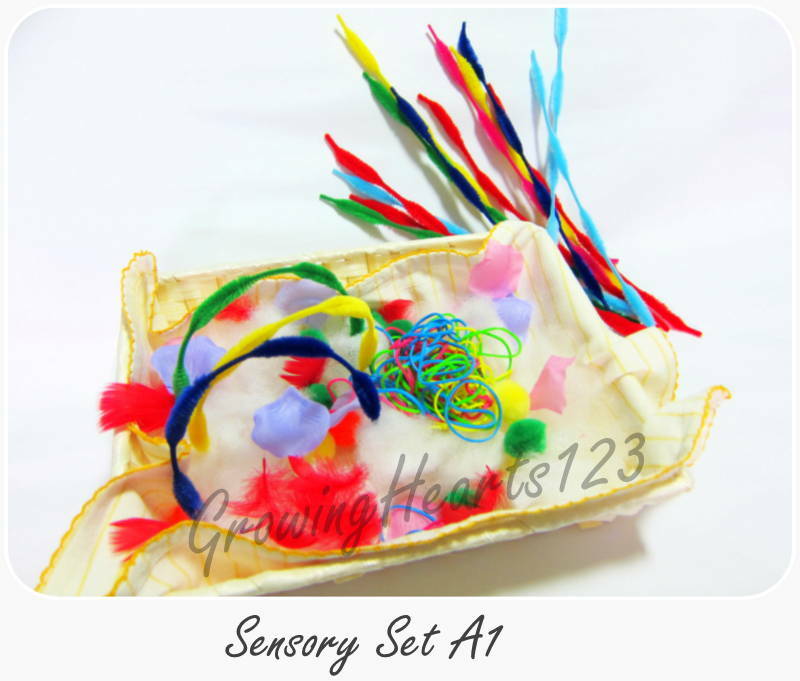 This is in contrast with the Sensory Set A1 which consist of all things Soft. The below is a combination of Set A and A1. You can set up the ‘hard’ items first and do the soft’ set up on another day and mix and match them up in any way you want. 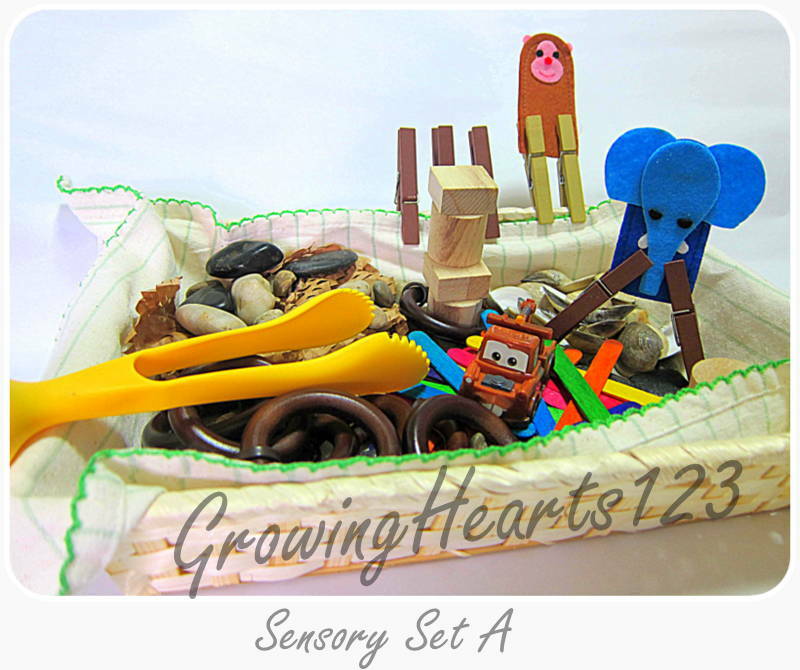 This is an example of a themed sensory bin. 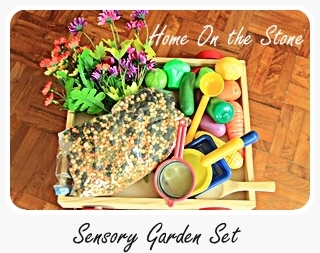 A mixture of lentils, green beans, soya beans, and black beans make up the base material, providing a lovely sensory experience and practice for transferring skills. The flowers and leaves can be snipped off from the stalk and your child can have fun “planting” them in her garden. The colourful array of spades and scoops is perfect for digging and shovelling. And the plastic vegetables can be used to instil an appreciation about where vegetables come from (they don’t just magically appear on the dinner table!). For the next set, we provide salts of a whopping nine different colours! There are so many ways to play with this. Just running your hands through the salt is an amazing feeling. 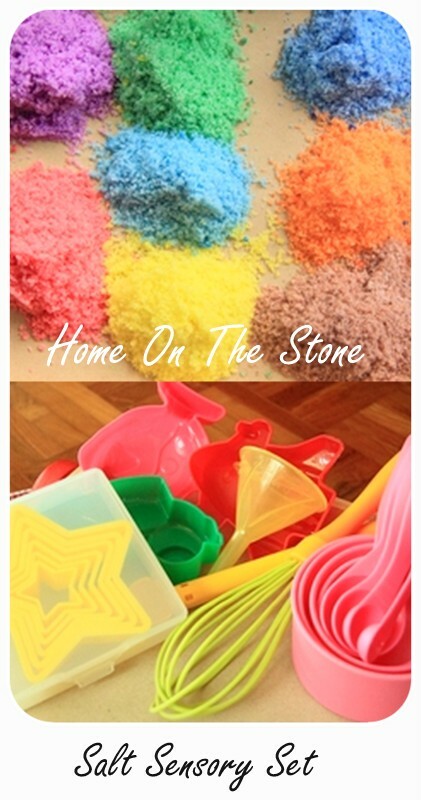 Your child can play around with the various colours – combine them, sort them into different mounds – or make salt castles or shapes with the moulds provided. It can also be used to make colourd salt bottles as a gift or a pretty display, like this example from Ingspirations. This is a Wet Set. It consists of a clear container, measuring cup, recycled cleaned bottle and caps and shaving foam to play with the packet of corn flour. Check out my foam dough and water with corn flour play for ideas on how to play. You can also simply use water to play and measure water levels. 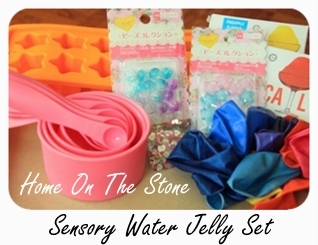 The water jelly set contains an ice cube tray and jelly powder for making ice and jelly. To up the fun quotient, add food colouring and glitter to your ice. All the jelly-squishing that goes on during this sensory play session is great training of motor skills. 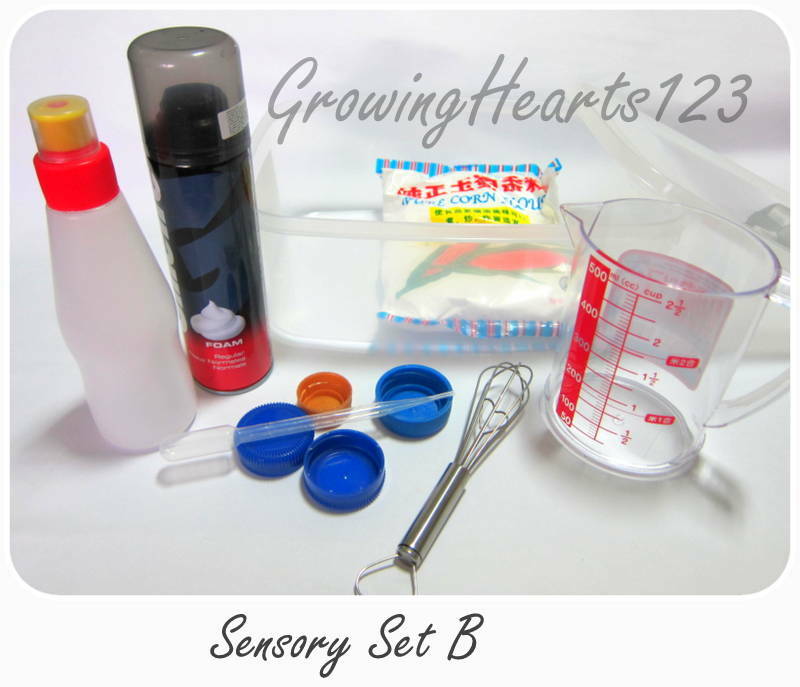 Measuring cups and spoons can be used to teach about size, weight, and quantity. Provide two or more containers for scooping back and forth. Blow up the balloons and fill them with water for a bouncy balloons party! This is also a great opportunity to see the science of ice melting in action! This is catered specially for the Primary levels. This includes 2 packets of white and terracotta clay packs. It is a favourite as this brand beats many clay products in it’s smooth and quality texture. After moulding, the clay can be air dried naturally. I have included magnets so that you can make clay magnets if you wish. Click clay making for details of how my kids create clay works. The white bottle is PVA glue to secure the magnets onto the clay. A note on clay making. The 2 sticks that you see are Not chopsticks. They are ‘bars’ for you to place your clay in between as shown in the photo top right hand corner. These bars will determine the thickness of your clay pieces as you roll it under the pin roller. Cut a small block with the aid of your metal or plastic ruler and then place that slab for rolling flat. The beads and sequins can be embedded into the clay as decoration. My Co-Host Valerie from Home on the Stone – Water, Ice pasta and more! Giveaway ends 24th May 2015 midnight. Winners will be announced on the blogs and Facebook Pages. Winners must respond within 24hrs, otherwise the gift will be given to another new winner. A suitable delivery arrangement will be co-ordinated between winners and bloggers via e-mails. Click on the Red label Rafflecopter Giveaway below to participate. *Remember to indicate your preference for Set 1 or 2 or 3 or 4 in my Blog or your Facebook comments. Thank You for sharing our journey, may you have a SENSE-a-tional Playtime! Please click on RAFFLECOPTER for your results. Winners will be notified by e-mail. Interesting play sets for exploration. Even I’m spoiled by the availability of different types of play sets. Wanna try them out myself too. Set 4 to play with my 3yr plus! Would like Set 1 or 3 as they are the most interesting! Hi there! Always a joy reading all the interesting stories and play ideas you have. Such an inspiration! Jayden (5yo) & Jayran (4yo). Hiya, would love to win Set 4 for my 6 yo! He is really into creating craft pieces to give away to friends. 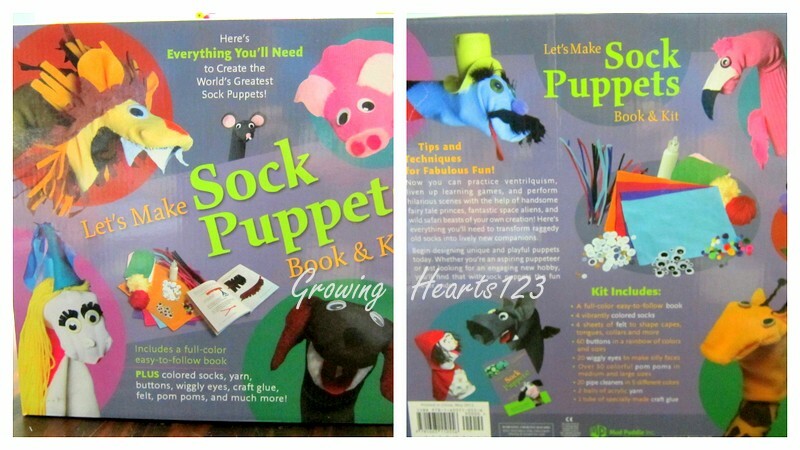 I would like to get set 4 for my 6 years old. Set 4 for my 4 year old who loves playdough and other clayworks. 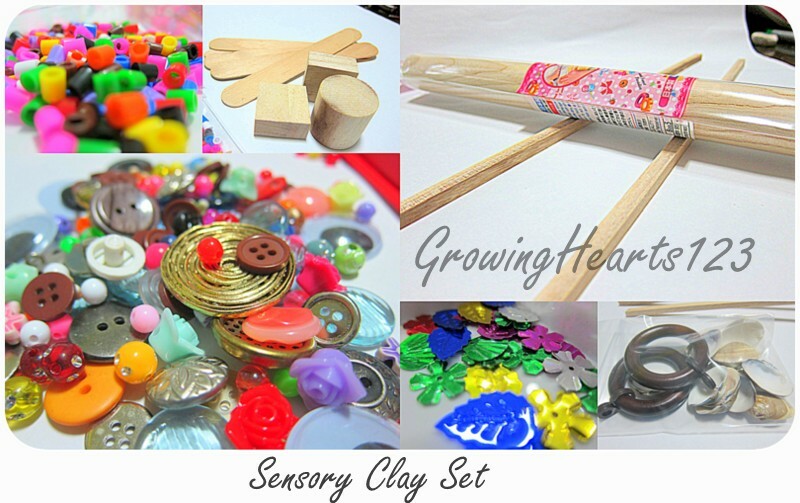 SET 4 : Includes Sensory Clay Set for my 10 year old girl. She love craft so much. Thanks. Set 3 for my 2yo and 5yo. 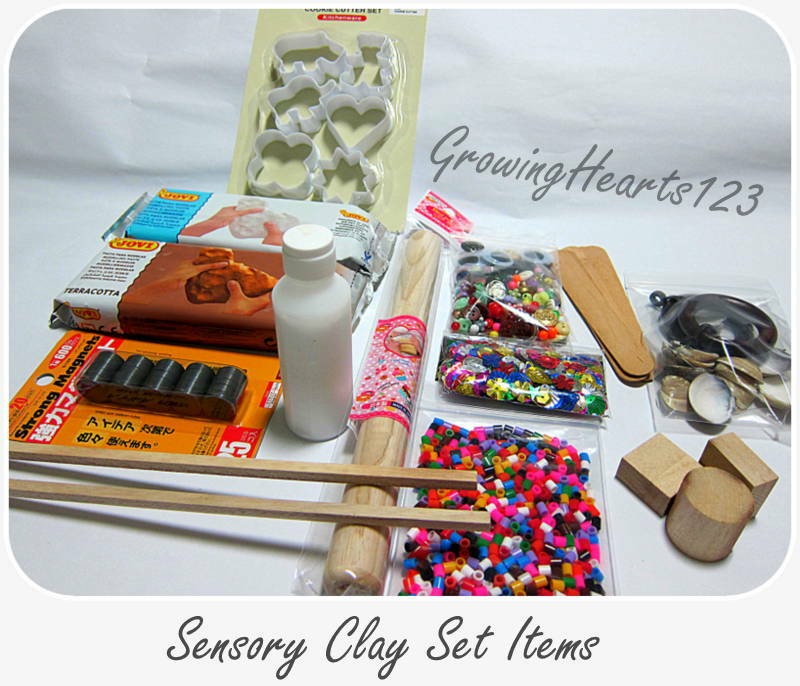 My kids are 7 and 4…they would definitely love the clay set 4! Set 4 for my kids aged 2 and 4 !!! What a lot of great ideas Angelia. I would love the clay set 4. Thanks for hosting this. I would like to win Set 1 for my 4yrs and 2yrs old girl. would love to get set 1 for my boy~ Thanks for sharing! I think my going to be 3yrs old boy will enjoy Play Set 4! I would like to win Play SET 3 for my 4 yrs old girl. I would like to win set 2 for my 3 year old please ! Thanks! Oh so lovely! Thank you for taking the time to compile all the links and ideas, the ideas and the sets are so inspiring! I had a hard time choosing, but I would love to win Set 2 (or Set 1) for the kids. They are 6, 3.5 and 1! Sorry forgot to add, I shared the post on the blog FB instead of personal FB, as that has a better reach. I hope that is ok? My email address is kayetky@gmail.com.